very colorful and nice quality. 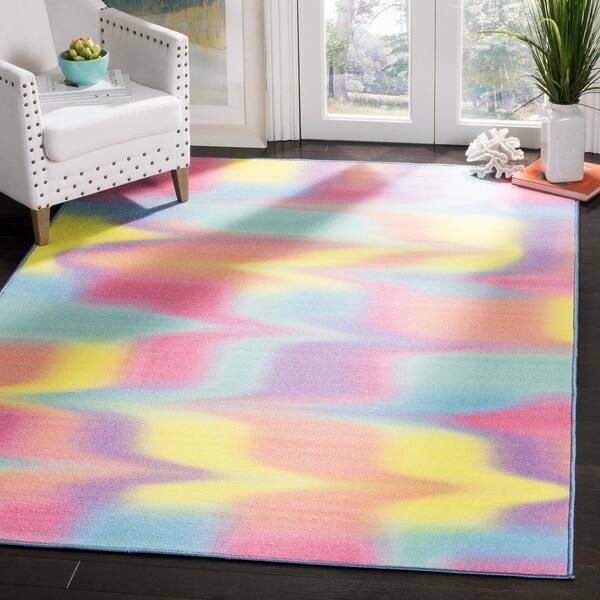 Safavieh Paint Brush Pink/ Yellow Area Rug - 5'1" x 7'6"
Make a fashion-forward splash with a cheerful rug from Safavieh's Paint Brush Collection. From tie-dye to watercolor-inspired designs, these abstract patterns allow for artistic interpretation so that you can design the creative room of your dreams. Their contemporary bohemian style is perfect for an eclectically styled home and is made of durable stain-resistant nylon, perfect for high traffic areas. The colors are exactly as shown. Super bright and fun to look at. Really brightens up the living room! The pile is lower which is what we were needing. We didn't want a plush rug. Still comfortable to walk on. Rug is very vibrant and cute. The only negative is it is thin and not very heavy. Cute in preteen room. good quality my daughter loves it! This is more beautiful in person. Very so soft on bare feet too. Love it! Safavieh Aztec Southwestern Orange/ Multi Area Rug - 5'1" x 7'6"
Safavieh Dallas Shag Pink / Ivory Rug - 5'1" x 7'6"